Summer is and always has been my favorite season. Of course, the irony in that is that I spend many more days looking forward to its arrival than it actually consists of and am able to enjoy. For me, this summer flew by. I’m not quite sure why this year’s summer months sped by as quickly as they did; yet as I check the date on the calendar and listen to all of the State Fair advertisements, there is no denying fall is around the corner. Summer is ending and while I am sad to say goodbye to the warm days and sunshine, the change in seasons is also refreshing for me. It is a chance to start fresh (whatever that means for you) with a new season. Just like the change in Minnesota seasons, ICF Minnesota has new season to look forward to. The new members will bring new energy, ideas and excitement to the upcoming ICF season. That means the opportunity for more growth and connection – both personally and professionally! Please join us on Tuesday evening, September 18, as we hear from three organizations on how coaching has made a positive difference in their places of work. We are approaching the finish line of the Ignite Project! The final Zoom call with our fabulous coaches will be held on September 13. And the completion call with Neighborhood House is scheduled for September 17th. We look forward to reporting summary results in the October Newsletter. Most organizations avoid scheduling evening events during the final week of a Minnesota summer, assuming attendance will be so low, it might not be worth the effort. That’s not how professional coaches roll, at least not those members of Minnesota’s Chapter of the International Coaching Federation. On August 28th, nearly 90 professional coaches packed a room at the Metropolitan Ballroom in Golden Valley to hear Ann Betz, CPCC, PCC, CNTC, and co-founder of BEabove Leadership. 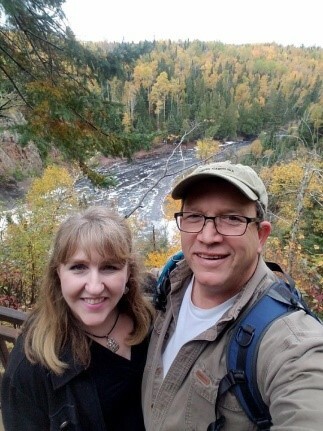 Not only is Betz a Minnesota native, but she is also an International speaker and trainer onthe intersection of neuroscience, coaching and human transformation. Caffeine was not necessary to keep this evening crowd awake and engaged after a long day of work. Betz’ belief in what she is preaching was palatable as she energetically used humor, stories, real life examples and movement. Her message--the power of understanding neuroscience for helping people create the change they want in their lives. Neuroscience is a 50-year-old discipline but has only been in the public mind from the leadership and coaching perspective for about seven years. 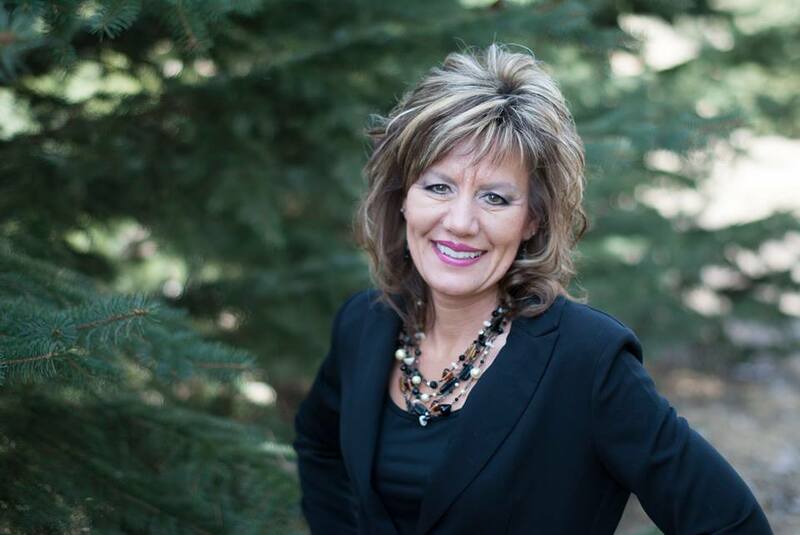 Betz began her career working with nonprofit organizations and is trained as a professional coach. She began studying neuroscience because her clients wanted evidence that coaching works. As Betz began learning about neuroscience it helped her understand why coaching is possibly the best thing a person can do when wanting to create meaningful and lasting change. Science has discovered neuroplasticity, which means our brains are malleable, and can grow, reshape and restructure the neural pathways. This is where coaching comes in. The rational brain operates on reason. Before clients will engage with coaches in activities that allow access to their intuitive brains, coaches need to give their clients’ rational brain a bone—structure and reason. Once coaches help clients access their intuitive brain, they help build their capacity for creating and sustaining change. In the brain there are two networks: Task Positive Network (TPN) and Default Mode Network (DMN) These networks are habitual, and one may be stronger than the other based on which was rewarded more often. Task Positive Network (TPN) – is good for getting things done and people who can’t activate their TPN have difficulty doing so. 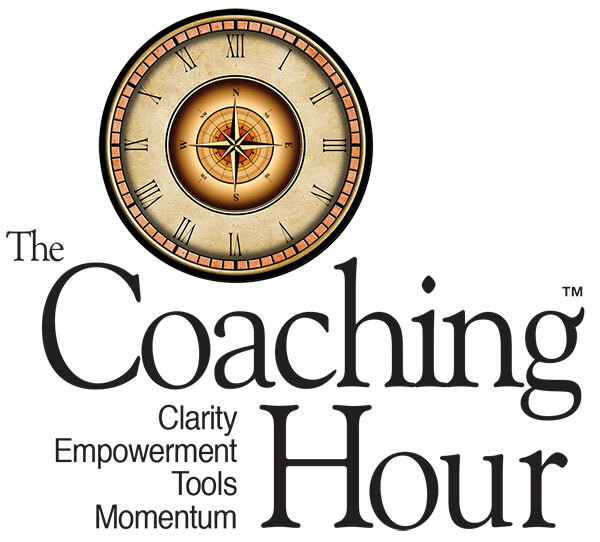 If you only coach here, you will only get as far as transactional coaching. If you never spend time here, you and your client will wander and never make any progress. Default Mode Network (DMN) - When in this mode, you dream, envision the future, develop long-term memory, gauge other’s perspective, understand others, and experience introspection. If you only spend time here, your client will remain in rumination (negative thinking). Task mode helps avoid your DMN. For those who ignore DMN all-together, they miss out on a certain kind of inner-wisdom they are carrying around but not accessing. 2. 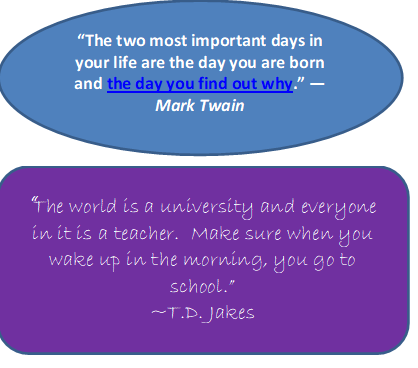 Willingness to fail/Exploring outside of the comfort zone, do “silly” stuff (play, humor). There is wisdom to be found in the silly and relaxing things. We know that a) Neurons that fire together wire together, b) The more we use a neural pathway, the more developed it becomes, and c) The more developed the pathway, the more automatic it becomes. ‘This walking thing is not for me.’ They just haven’t developed the neural pathways yet. In the end, all decisions are based on emotions. Without access to ones’ emotions how can you make decisions in a way that best supports you and your organization? Coaches help clients explore issues in multi-sensory way. “What does that taste like, how does it feel, what does it smell like?” The more neural pathways we have associated with a specific behavior, the stronger that neural network becomes. So why do you need to hire a coach? Can’t you just do this for yourself? Science says the answer is “No!” The neuro pathways created in your brain are already entrenched based on habits developed over months or years of practice. To un-trench them, it takes something to disrupt the pathway enabling you to create a new one. Coaches and their techniques are that disruptor. Betz gave attendees a lot more to chew on than what I’m sharing here, just ask anyone who attended. 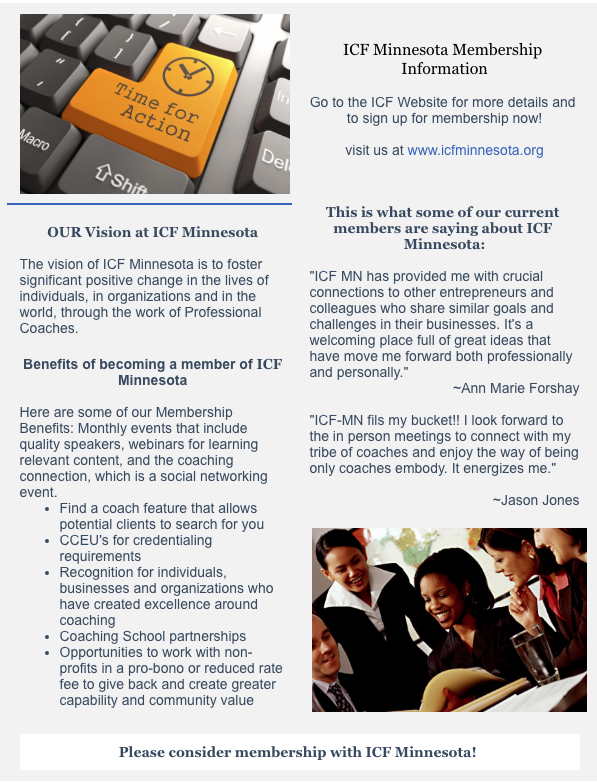 If you don’t want to miss out on ICF Minnesota’s next event, go to their website and view the ICF Minnesota Event Calendar which is updated regularly. The 2019 Calendar will be out in early December. As coaches, we have a better than average understanding of triggers. We know that any change we set out to make will eventually lead us right into a trigger. 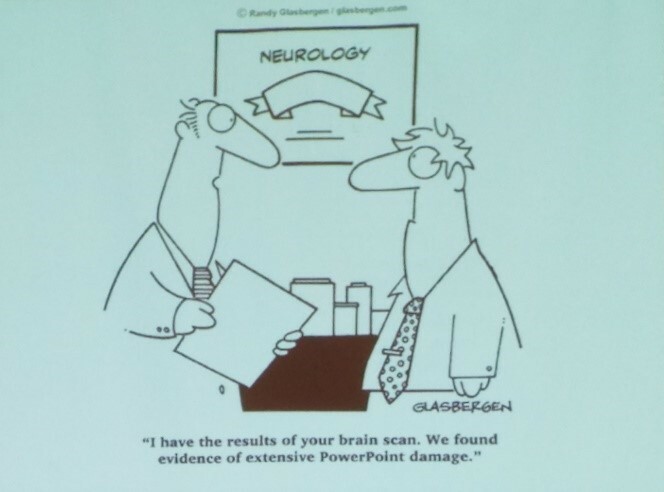 We work with clients who find this out quickly too. This book takes a deeper look at triggers and how they play a significant role in any change process. There are 15 Belief Triggers that stop behavioral change in its tracks and I’m sharing the three I resonate with the most. Read the book to get all fifteen belief triggers and consider how they show up when you set out to make a change in your life. Marshall also proposes a proven and simple method for making and sustaining change in one’s life. Definitely check it out! 2) I love music and concerts. I’ve seen 30 bands in the past 3 years. Best concerts have been the Eagles, Jimmy Buffet, Santana, Peter Gabriel, Sting, Earth Wind and Fire, Queen and Cold Play. Oh and U2! 3) I wanted to be a farmer until I was 16 when my Mom talked me into being a buyer. I worked in retail for the first 25 years of my career including almost 20 at Target. 4) I HATE, I mean HATE, I mean LOATHE camping! I love the outdoors, the animals and stars and such; I am much more of a cabin gal WITH indoor plumbing and electricity! 5) I love to spend time with my family- they are my heart, cooking, traveling, visit museums, collecting art, having parties, spending time with friends, the sight and sounds of the ocean, shopping and coaching! Opportunities for our certified coaches to work with non-profits in a pro-bono or reduced rate fee schedule to give back and create greater capability and community value. Thank you to the 40% of members who voted for our new board members. This is a working board and these board members give their talents and time to make ICF MN a great chapter. ICF Global has an entire online learning series on Business Development? ICF has recently updated its credential application process to comply with new European regulations for data security and privacy. ICF now requires applicants to complete an attestation of their coaching experience hours by answering a series of questions within the credential application and providing the applicant’s signature verifying accuracy. This replaces the submission of a coaching log and is intended to help protect the privacy of coaching clients. To view the updated requirements, click here: https://coachfederation.org/experience-requirements.